The little brother of the Code becomes more resistant. With a brand new forged dual diameter four piston caliper, Code R offers increased power without compromising control or feel. With a streamlined design making it more affordable, R Code retains the values ​​of the family code in terms of reliability, durability and ultra simple maintenance. Now with the braking system of the constant TaperBore technology as well as the elegant and powerful integrated over Geometry ™ Avid has already proven Power Reserve tank, the Code R will make you think twice before you call this brake "Little Brother". We know that accidents can happen, which is why we created Bend Zone. In a big jolt, which would break a traditional lever, the Bend Zone technology allows the lever to twist, without serious damage to the body. You'll not only be able to cross the woods without resorting to too sudden braking but you do not even have to buy a new lever body. The boundary between fact sudden braking and brake so suddenly that you skate, is minimal. A Stroke Modulation allows riders to perfectly navigate that line problem and even control the most powerful brakes with finesse. 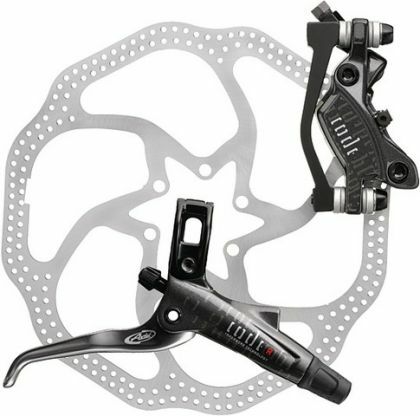 With TaperBore ™ technology, we integrated the reservoir and master cylinder on our hydraulic brake levers hard in order to create a very elegant (and even lighter) lever design. With Matchmaker, gain weight and sober at the hanger. This system combines Avid ® levers, several levers SRAM ® and PushLoc RockShox controls, all thanks to a discreet and lightweight collar. At the end of the day, a brake lever simply multiples the force your hand generates (just like the nut cracker). Power Reserve Geometry ™ Avid is by itself a way of thinking about the physics of leverage and comfort of your hands. This philosophy is fundamentally different than others on the market brakes. Due to pivot placement, physics dictates that with other brake levers your fingers tend to slip off the ends as you pull. Avid is different. We designed our levers with the pivot closer to the handlebar, closer than anyone has ever dared to market. This reduces the inner lever stroke and an arc that naturally hugs your fingers, allowing you to provide greater stopping power. What's great is that every Avid lever has it. The term "TaperBore" refers to a unique and revolutionary locking system patent pending for our new Elixir and Code levers. It is lighter, has a very sleek, improves leverage and especially gives you more power and control. The flexibility of adjusting the guard without having to leave your tools. You could see your dévissiez or levers, just a few turns with enough clearance adjustment without tools. When maintaining your bike is the only thing between you and the road, every second counts. With our mounting pads from the top, the new disc brake pads can be installed without removing the wheel without having to work under the caliper or pad juggling upside down, so you'll be ready to go again faster. AVID 2013 CODE R Frein Arrière Gris Disque HS1 200 mm PM/IS clasificado 5.0 de 5 por 1.